For over 20 years, Sussex Heights has been protected against driving rain and airborne salts by RonaBond Crack Bridging Anti-Carbonation Coating WB. 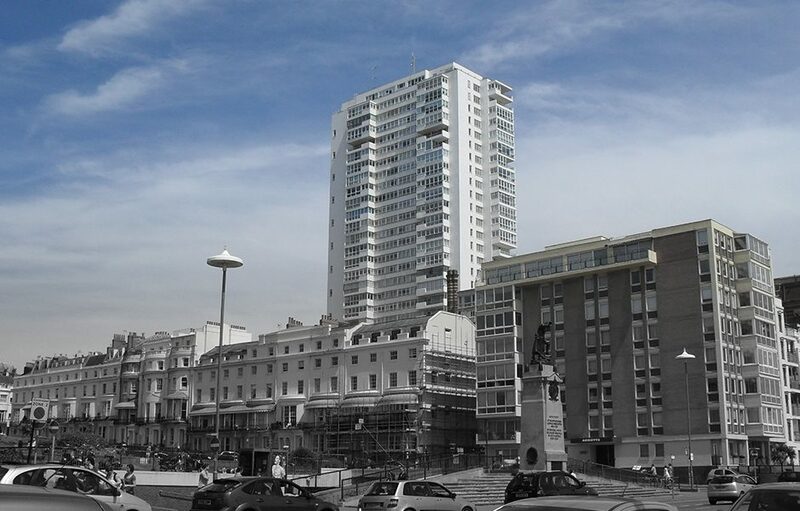 Situated close to the West Pier, immediately behind the Brighton Hilton Metropole Hotel, Sussex Heights is a 24 storey landmark block of luxury apartments. Sussex Heights was built in 1965 and was originally clad in mosaic tiles, but by 1990 it was clear that the tiles were no longer protecting the structure against water ingress from rain, driven by the prevailing South Westerly winds. To restore the building to its former glory and to prevent further damage, the tiles were removed, repair works were carried out and the entire building was coated with RonaBond Crack Bridging Anti-Carbonation Coating WB. RonaBond Crack Bridging Anti-Carbonation Coating WB is a waterproof, elastomeric anti-carbonation coating, chosen to provide a rainproof envelope to the structure and protect the reinforced concrete against attack by airborne salts and acidic CO2 gases. Key to the specification was a 10-year insurance-backed guarantee, underwriting the performance of the product and the application. The guarantee was the first to be underwritten on such a contract in the U.K.
By 2001 the coating was reaching the end of its 10-year warranty period and the client’s building consultant, Lambor Associates Surveyors, approached Ronacrete Ltd to prepare recommendations to re-coat Sussex Heights, to enable continual cover and a 10-year extension. Inspection of the existing coating showed that it was in good condition, free from defects and well bonded to the substrate, a testimony to the performance and longevity of the product in a very aggressive environment. RonaBond Crack Bridging Fabric, a glass fibre reinforced coating product, was specified for the second contract, to provide extra durability and resistance to structural movement and substrate cracking, with a top layer of RonaBond Crack Bridging Anti-Carbonation Coating WB to provide rain resistance and prevent dirt retention. A further 10 year guarantee was issued on successful completion of the works. Concrete Repairs Limited, a contractor with specialist knowledge of concrete protection was awarded the contract to re-coat the building in two phases. The phases were carefully planned to be carried out over a two year period around the migration habits of the Peregrine Falcons that nest on the roof of Sussex Heights. The existing coating was cleaned and refurbished to a very high standard under difficult access conditions, requiring extensive use of cradles to provide a cost effective and timely solution to the client.